Everything you need to know about the Sri Venkateswara Temple or Tirupati Balaji. Sri Venkateswara temple or Tirupati Balaji is one of the most famous landmarks of the world on the hills of Tirumala in the Chittoor district of Andhra Pradesh, India. The temple is gloriously described by the Hindu scriptures as the earthly location where Lord Vishnu resided in the age of Kali. It is the richest temple on the earth with strong contributions and donations from the public and one of the most famous pilgrimage spots in India. There is also a famous belief about making donations in the Hundi present at the temple. It is believed that once Lord Vishnu had taken a loan from Kubera (Hindu God of wealth) to carry out his wedding proceedings. People donate in that Hundi to help the good lord repay his loan to Kubera. It is also believed that the donations made to the lord in the hundi come back to the devotees in many folds. This sacred spot on the hill is about 2,800 feet above the sea level is known as Tirumala, the abode of Lord Venkateswara. Once Sage Bhrigu wanted to know who is the most supreme among the Hindu holy trinity of Brahma, Vishnu and Mahesh (Shiva). Not satisfied with Lord Brahma and Shiva, he went to Vaikuntha (Vishnu’s abode) and kicked Lord Vishnu on his chest to grab his attention. Since Goddess Lakshmi resides in the chest of Lord Vishnu, she felt insulted and left Vaikuntha and came down to the Earth. Lord Vishnu came to earth in search of Lakshmi who had by the time taken birth in the family of a king with the name Padmavati. As time passed, Lord Vishnu married her at the Tirupati hills and got enshrined there forever to protect and take care of the people of the Kali age. It is an age-old practice to donate hair at this temple. People of all ages make their prayers and shave their heads near the temple premises before having a darshan of the Lord. To help the people make their hair donations to the Lord, the temple management has set up proper facilities. 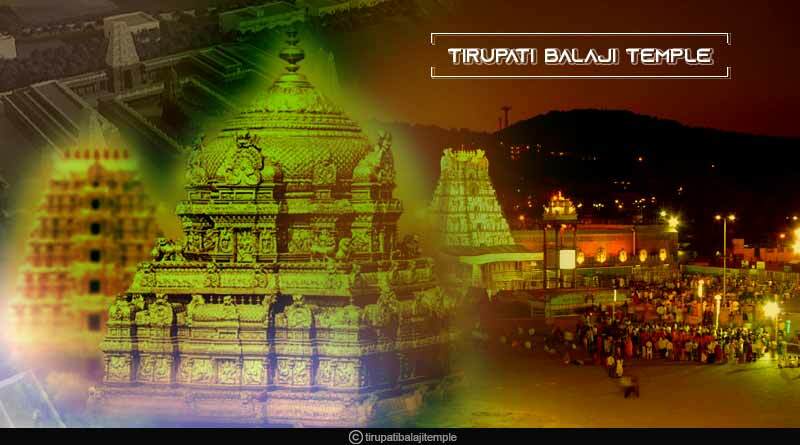 The Tirupati Balaji temple is also called the Bhuloka Vaikuntam which means the abode of Vishnu on earth. It is believed that Lord Vishnu has manifested himself in this temple during the Kali age to guide and direct his devotees towards salvation. It is also said that the main idol of Lord Venkateswara is very unique and powerful. The Gadwal Samsthanam and the rulers of the Kingdom of Mysore visit the temple regularly and make generous contributions. During the middle of the eighteenth century, Maratha general Raghoji I Bhonsle established a permanent body to administer the temple worship. The Tirumala Tirupati Devasthanams (TTD) was instituted through the TTD Act in 1932. Today, it is the TTDs that manage and maintain many temples and their sub-shrines under its able management. It is one of the most interesting and wonderful pilgrimage destinations in India. It is now a highly developed town which is well connected with the major cities of India via bus and train. There are also well-laid roads leading to the city from Chennai and Hyderabad. From Tirupati, the entire stretch of a route leading to the Tirumala hills is laid with metal roads and pathways for both pedestrians and people journeying in buses and cars. For more articles like ‘All about Sri Venkateswara Temple’, do follow us on Facebook, Twitter, and Instagram.